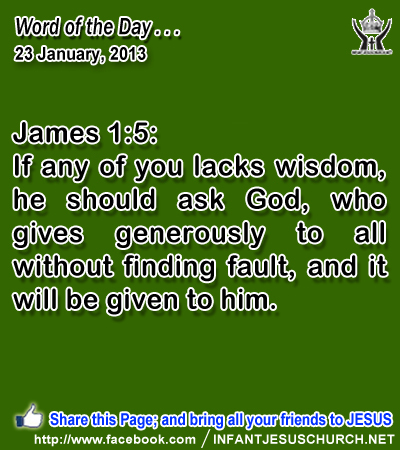 James 1:5: If any of you lacks wisdom, he should ask God, who gives generously to all without finding fault, and it will be given to him. Heavenly Father, Gracious giver of all good gifts, please bless us with wisdom today. Let us reflect your will and live for your glory in all our decisions. Let your Kingdom guide our heart as we make our choices and have your Spirit lead us in your ways. We confess, Father, that we cannot guide our own steps without your help. So grant us wisdom this day. We pray in Infant Jesus name. Amen. Christians celebrate Sunday as the Lord's Day, to remember God's work of redemption in Jesus Christ and the new work of creation he accomplished through Christ's death and resurrection. Taking "our sabbath rest" is a way of expressing honor to God for that entire thing he has done for us. Such "rest" however does not excuse us from our love for our neighbor. If we truly love the Lord above all else, then the love of God will run over to love of neighbor as well. Do we honor the Lord in the way we celebrate Sunday, the Lord's Day and in the way you treat you neighbor? Loving Infant Jesus, in your victory over sin and death on the cross and in your resurrection you give us the guarantee of sharing in the eternal peace of heaven. Transform our heart with your love that we may freely serve our neighbor for his good and find joy and refreshment in the festivity of Sunday as the Lord's Day.